The 2002 William Roberts Lecture, given at the National Portrait Gallery, London, on 2 February 2002. Text © Elizabeth Cayzer 2002 and reproduced by kind permission. William Roberts was blessed with a precocious talent. Whilst still a schoolboy special art lessons were arranged for him, and his father, a carpenter, made him a drawing-board and an easel. Furthermore, he encouraged his son to paint his headmaster. In 1909 the boy was apprenticed to Sir Joseph Causton Ltd, a poster-designing and advertising firm, while, in the evenings, he attended St Martin's School of Art. His days were long and intense, beginning at eight in the morning and ending at six in the evening after which he went on to St Martin's, arriving home at 10 p.m. But this was not unusual for a fourteen-year-old: his contemporary Mark Gertler, for example, was pursuing a similar path. Roberts's precocity met with its reward: in 1910 he won a London County Council scholarship to the Slade School of Art based upon the very favourable assessment of such works as this red-chalk drawing of The Artist's Father, Brothers and Sister, dated 1909, which shows six lively heads crowded together on to a sheet of paper partly, no doubt, to save money. Roberts's three years at the Slade were under the rule of Professor Henry Tonks  a stickler for the life class and the fundamentals of good draughtsmanship. At this the young artist continued to excel, winning prizes and capturing the attention of Tonks. An Old Man is an example of his style then. The model is an Italian  apparently many Italians were employed by art schools, and during the summer vacations they turned to selling ice-cream. This particular man had posed, when young, for Sir John Everett Millais, which he would proudly tell the students saying: 'Me Speak, Speak', for the painting in question's title was Speak! Speak! This is a fine and detailed portrayal of old age, the folds of the leathery skin, the sucked-in effect of the toothless mouth, and the wild hair all carefully described. It is almost romantic in style, but this was but a passing phase for Roberts, who by 1912 was alert to everything modern, while by 1913 he was positively Cubist in style. During the summer holidays of 1911 and 1912 some of the Slade's students were invited to stay for several weeks with various of Tonks's friends in the country; there they were able to draw and paint in relaxing surroundings. Roberts went to the home of Sir Cyril Butler (honorary secretary of the Contemporary Art Society) and, whilst there, he was commissioned to do a series of six London market scenes for him. In addition, the Fitzwilliam Museum have a red-chalk portrait drawing of Butler which Roberts later authenticated, saying that it dated from the visit. And this, it seems, is how a number of his most interesting portrait commissions came about. He never set himself up like, for example, Sir William Orpen or, more reluctantly, Augustus John as a portraitist. He was, and certainly until the later 1940s remained, an occasional painter of people's portraits. I now want to look at four portrait paintings commissioned by people who came to know and admire William Roberts's work early on and who, in the inter-war years, sat to him. They were Rudolf Stulik, the proprietor of the Hotel and Restaurant de la Tour Eiffel in Percy Street; P. G. Konody, the art connoisseur and critic; T. E. Lawrence  Lawrence of Arabia; and the economist and art lover John Maynard Keynes, whose double portrait with his wife, the ballerina Lydia Lopokova, is on view here in the National Portrait Gallery. I will be giving you quite a lot of background information about these sitters, because I feel that it is vital to an understanding of how Roberts responded to their characters, and to what one begins to feel may be missing from that response. imported from [Vienna] a new note of gaiety and style. Himself the result (as he hinted) of a romantic, if irregular, attachment, in which the charms of a famous ballerina had overcome the scruples of an exalted but anonymous personage, he was in any case well equipped by nature for the part he played The 'Tower' became under his management a favourite resort of poets, painters, actors, sculptors, authors, musicians and magicians [this is John writing still]; not to speak of members of the fashionable and political world. In 1916 the Hotel Review praised 'the excellence of his cuisine and the quality of his wines'; they were second to none in the West End of London. How, then, did the young and impecunious William Roberts come to frequent such a smart restaurant? It was thanks to Wyndham Lewis, who can be seen in the centre of Roberts's later painting The Vorticists at the Restaurant de la Tour Eiffel, which records events there in the spring of 1915. Lewis had been living in Percy Street since 1914 and having most of his meals next door at the Tour Eiffel. He soon became a favourite of Stulik's, who, according to Roberts, used to tell him: 'I vould [sic] do anyting [sic] for Mr Lewis.' In the earlier part of 1915 Lewis was deeply involved with his new magazine Blast and the promulgation in it of Vorticism. He had gathered a group of adoring, and not so adoring, artists around him. From his next-door flat he swept them round to Stulik's for dinner on a number of occasions, the meals being paid for by a mixture of Stulik's individual style of accounting  which allowed his rich clientele to pay for his impoverished, but talented, clientele  and by these talented young people earning their keep. That is, in the case of Lewis  and later Roberts  making paintings for Stulik's growing, but artistically haphazard, collection. Roberts painted his portrait of Stulik in 1920 when he, too, had come to live in Percy Street. He had by then known the Austrian for five years and had, during the war, used one of the cheap hotel rooms over the restaurant as a base whilst on leave from the front. Number One Percy Street had become something of a haven for Roberts, a place where, after the birth of his son, John, in 1919, he worked on a set of decorative panels for its proprietor while mother and son were left in the tiny attic flat further down the road until it was time for the next meal. This painting, now unfortunately lost, is like Roberts's painting of Paul Konody  also dating from 1920  just a head and shoulders. This was a format that the artist liked, for he said that it meant that nothing detracted attention from the face. Even without the personal attributes we are accustomed to see in a conventional portrait painting it is clear that Rudolf Stulik is some sort of an impresario, and probably a foreigner too. The turned-up collar, the bow tie, the moustache, the tilt of the head and the discreetly veiled eyes all suggest this. It is a relaxed, affectionate portrait of the proud proprietor of a famous London restaurant. It complements very well the description given of him by Adrian Daintry. His English was 'guttural and almost incomprehensible'  but this was 'part of his charm. He had tact as well, and knew how to flatter when necessary, and also when to be patient.' And, continued Daintry, his discretion was legendary: 'A certain vagueness had settled round him, perhaps as a result of the strain of his life, with its late hours and conviviality, and it was proverbially difficult to get the truth from him about any of his customers' movements, except by taking the reverse of what he said as probable.' In the picture Roberts has eschewed the mannerist, Cubist style still very apparent in his figurative work of this date, for example The Cinema, now in the Tate Gallery's collection, for a more realist and sensitive interpretation of his sitter. William and Sarah Roberts retained their fondness for Stulik always, and it seems never to have been tinged with any sort of bitterness or doubt, as were some of their other friendships. This fondness is evident in The Vorticists at the Restaurant de la Tour Eiffel, painted in 1961, many years after Stulik's death. It shows him holding a plate on which lies a piece of his famous Gâteau St Honoré, which Roberts described as 'a large circular custard tart ornamented round its edge with big balls of pastry'. 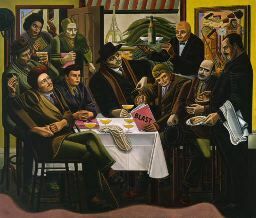 He and Wyndham Lewis dominate the picture as they did, in different ways, the young artist's life in 1915: Stulik's elegant hospitality is in marked contrast to Lewis's swaggering bulk, whilst a boyish Roberts sits grim-faced, hands folded over his copy of Blast. Historical events are held in a kaleidoscope, the heady days of Vorticism, Roberts's later assertion of his role in it  and independence from it  and Stulik's benevolence all weaving their threads through this finely composed picture. But for the purposes of this lecture the restaurant's style and setting, together with its staff and more racy clientele, are all that needs noting. In 1917 Konody was appointed the art adviser and honorary secretary of the Canadian War Memorials Fund, whose objective was to provide a memorial in the form of paintings and sculpture to the Canadians' part in the Great War. The Fund was financed by Lord Beaverbrook and Viscount Rothermere, the latter being the proprietor of The Observer. I will send you on some more things that will have less 'Cubism' in them, but should a meeting of your Committee take place before they reach you, will you only exhibit those that you think would not puzzle too much the meeting. Perhaps some of my earlier and slightly more finished drawings could be brought together for the show as well. Tonks has one, so too has Captain Baker. Cyril Butler of Shrivenham a friend of Tonks has one or two. I could write him if you wish. Then Professor Brown at the Slade has a drawing which I think would be good to show. Paul Konody's portrait commission in 1920 was timely. Roberts was desperately hard up: 'I have been in such a turmoil over money matters as not to know what I have been doing at times,' he wrote to Alfred Yockney, Konody's counterpart on the British War Memorials Committee  also his employers. Indeed, he was selling drawings he had put together for a show in order to make ends meet and to feed his girlfriend Sarah Kramer and their baby son. The painting has much in common with that of Rudolf Stulik. Again it is a head and shoulders set against a plain background. Konody was aged forty-eight then and in his prime, and Roberts shows an alert, energetic and kindly face. The rapport between artist and sitter seems total; there is none of that withdrawal of communication which would characterise later portraits. A few years after this picture was painted Konody wrote about Roberts's portrait style, interestingly comparing him with the fashionable Gerald Leslie Brockhurst. He saw an affinity with Brockhurst's 'Leonardesque heads  the same clear-cut design, decorative spacing, strong characterisation, clean execution, and colour unmodified by reflection, though Mr. Roberts is mainly interested in the angles and edges and planes of the head, and Mr. Brockhurst in the roundness and tone transitions.' Always, it seems, Konody's criticisms of Roberts's work were considered and just: no wonder that Roberts's admiration for him never dimmed and that he remembered him over fifty years later when Barrie Sturt-Penrose, one of his successors at the Observer newspaper, wrote a highly-coloured article about the artist. Sturt-Penrose, retorted Roberts, is 'not in the same class' as Paul George Konody: how right he was! By November 1922 William Roberts was discussing a very different portrait commission, his sitter a man attempting to run away from fame, for Lawrence of Arabia had had fame thrust upon him partly because of the journalistic exploits of the American Lowell Thomas. As an undergraduate at Jesus College, Oxford, T. E. Lawrence had learned Arabic in order to visit the Crusader castles of the Middle East and make a study of their military architecture. He returned to the area, upon graduating in 1910, as an unsalaried assistant attached to a team of British Museum archaeologists. He was put in charge of recording the pottery being found but also, because of his knowledge of Arabic, of the labour force drawn from the local village. He was much liked by them, and began to involve himself deeply in their culture and their aspirations for total independence from the Ottoman Empire. When war broke out in 1914 Lawrence joined military intelligence in Cairo and the following year began his association with the Emir of Mecca and his four sons which led on to his part in the Arab Revolt of 191618. At the Paris Peace Conference he acted as Sherif Feisal's interpreter and adviser, but was bitterly disappointed  although not totally surprised  when the Allies did not honour their promise of independence for the Arabs of the Arabian Peninsula. Lawrence's was a complex character: at once a loner, and independent of many of the material needs of his contemporaries, he yet revelled in company and particularly that of writers, artists and intellectuals. There was an element of the secret about him, especially concerning his experiences during the Arab Revolt. When Roberts met him in 1922 these 'secrets'  along with a terrible guilt for having betrayed the Arabs' belief that he was working to end their vassalage to the Turks  were torturing him, for he had begun to write the story of his two years in the desert. Since boyhood Lawrence had loved books, and so he decided that his story, Seven Pillars of Wisdom, would be produced as a de-luxe, limited-edition book, fully illustrated as well as having included in it portraits of the main protagonists in the Revolt  Arab and British. Along with a number of other artists, William Roberts was brought to Lawrence's attention, and his work for the book soon delighted him. This drawing of Sir Henry McMahon is an example of one of Roberts's portrait drawings for it. McMahon was British High Commissioner in Egypt at the outbreak of war. On first seeing it Lawrence wrote to Roberts saying: 'It's absolutely splendid: the strength of it, and the life: it feels as though any moment there might be a crash in the paper and the thing start out.' Lawrence continued to praise the artist's drawings of the British diplomatic and military personnel for Seven Pillars, but this is certainly the most 'alive' picture of them that I have seen: a leadenness is beginning to creep into his style, as if he is not entirely comfortable with his sitters. I feel something of this deadness is manifested in the Portrait of Lawrence too. To date, it seems that Roberts has achieved a good result in his portraiture if his sitters 'give' of themselves to him. I am particularly struck by the pictures of Stulik and Konody in this regard, two men who were completely on Roberts's side and massaged his self-esteem so to speak. The situation is rather different with Lawrence, who was in a state of mental turmoil  some of which can be read between the lines of Seven Pillars  and altogether too complicated a character perhaps for a young, shy artist to fathom Indeed, John Roberts in his autobiographical notes described both men as secretive and, as a consequence, felt that it was not surprising that they 'were not close'. In the early thirties William Roberts received what I believe to be his last really exciting portrait commission: it was for the double portrait of Maynard and Lydia Keynes. Yes, there was further patronage to come: for example, Keynes introduced him to some Cambridge academics; there were a few portrait drawings done of the military during the Second World War; and his later patron Ernest Cooper sat to him. But the Keynes portrait was the grandest stab at portraiture that he had before withdrawing behind closed doors to paint his family. John Maynard Keynes is best remembered as an economist, 'the cleverest man I have ever met' not only according to Isaiah Berlin but to Bertrand Russell, H. G. Wells and Clive Bell too. However, the author of The Economic Consequences of the Peace  that brilliant attack on the world leaders at the Paris Peace Conference and their ideas for reparation  was passionately involved with the arts. Indeed, he believed that the creative artist was more important than the economist or politician! His greatest friends before his marriage were Duncan Grant and Vanessa Bell, and they introduced him to painting and helped him to form his collection. Often he was able to mix business with the pleasure of another purchase, such as when the sale of Degas's collection occurred in 1918. Grant brought his attention to it by suggesting that perhaps his powers of persuasion could get the Treasury to release funds to the National Gallery so that they could acquire some of these paintings. Soon Grant was reading the following telegram: 'Money secured for pictures' and the National Gallery's collection was swelled by the arrival of works by Ingres, Delacroix, Corot, Forain, Rousseau, Manet and Gauguin. And, of course, Keynes also bought for himself while, in 1919, he had the satisfaction of being able to use the money he had been paid for the French translation of The Economic Consequences to purchase pictures from the Degas Studio sale. And Lydia Lopokova  what of her? 'What is this I hear, about Maynard Keynes marrying a chorus girl?' wrote one of his contemporaries. In fact Lydia Lopokova was a ballerina with Diaghilev's Russian Ballet who, in 1918, had won the hearts of her London audiences. One could argue, I suppose, that her performance of the CanCan in Massine's Boutique Fantasque had an element of the 'chorus girl' about it, but there was more to her than that! Lydia certainly cultivated this idiosyncratic use of language, for the actress lay within her. She did, however, read widely in English  Keynes had a fine collection of books  and she embraced English culture. Before long artists flocked to paint and draw her: Picasso, Duncan Grant, Glyn Philpot, Laura Knight and Augustus John, who frightened her so much that the sittings were abandoned. She was also sculpted by Frank Dobson, writing happily to Keynes about the work in progress. 'Dobbie's Lydia is charming. She has not the hair yet, nor the last covering of the skin, but she is such as her mother nursed her in womb. (Dictionary also gives uterus but womb is such a beautiful word if I would be poetess I would use it in great many works.)' From this, and from a knowledge of her general enthusiasm for art, I would imagine that she wholeheartedly endorsed the commissioning of Roberts's double portrait. Maynard Keynes's awareness of William Roberts's paintings must date back at least to 1925, when he formed the London Artists' Association in order to help young artists financially and with the exhibiting of their work. He believed that Roberts was one of the contemporary British painters 'whose work will really live', and ranked him alongside Duncan Grant as one of his two most preferred British artists. Roberts's preliminary drawing for the composition shows that his first thoughts for it did not change dramatically. In the final painting Keynes is given a cigarette  both of them smoked a lot  and his book is transferred to his right hand. The artist also hangs one of his paintings on the wall  Keynes owned a total of fifteen by him. 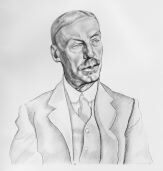 All this informs us about Keynes's love of the arts and fine books  his Edmund Spenser collection was enviable  but it tells us little about his personality, less about Lydia Lopokova, and next to nothing about the rapport between husband and wife: nor of their warmth, charm and wit, so obvious to all commentators. Photographs attest to their likenesses here: Keynes by the 1930s had grown bulky and balding, while Lydia was petite with high-cheeked Slav features. Roberts has been careful to make her form rounded and feminine, to contrast the soft material of her sleeves with the heavy cloth from which her husband's coat is made  or is it an overcoat? Both of their faces are heavily worked around the eyes, cheeks and foreheads as if make-up has been applied. Admittedly this is Roberts's manner, though the heightened colour makes it more pronounced. Their hands are bothersome, neither acting as a pair  Keynes's in particular  and they are too mannered to signify the couple's cultural interests. The painting of their hands also troubled Keynes's nephew, who described them as 'rendered with striking artificiality', while Robin Gibson's observations go further: 'A slightly abstracted and reserved work, it does capture something of Keynes' formidable personality ' He continues: 'The two elegantly curling hands holding apparently unlit cigarettes at the lower centre of the picture keep the composition together but scarcely unite the two figures psychologically.' However, it does appear from the documents that Keynes was content with the commission and that he continued to support Roberts financially until his death in 1946. I have deliberately spent time looking at these four portrait commissions, for the sitters were people who showed nothing but goodwill towards William Roberts. I have also described, at length, their characters in order to allow you to see how Roberts reacted to their personalities. I now want to turn to some of the family portraits and to look briefly at how the artist saw himself and his wife, Sarah. The photograph above on the left shows how Sarah Kramer looked when they first met  she was aged fifteen  and that on the right Roberts as a gunner in the Royal Field Artillery during the Great War. In 1984 the National Portrait Gallery mounted a large exhibition of these portraits  'An Artist and his Family'  so I do not want to cover the same ground again. However, I will show you a few of these portraits so that I can go on to relate them to the commissioned portraits and thereby draw some conclusions from all this about Roberts's achievements in this field. Here are two portraits of Sarah Roberts painted in the 1920s. Sarah was born in Leeds in 1900, the daughter of Ukrainian Jews who had settled there shortly before her birth. Her father was a painter who had trained under Repin in St Petersburg and had enjoyed court patronage. Her brother was Jacob Kramer, who, upon their father's death, had assumed financial responsibility for the family, making ends meet by drawing portraits. His principal model was Sarah, who from the age of thirteen sat for him, usually dressed as a gypsy. The drawings sold like hot cakes! Sarah was small, dark and perfectly proportioned. Shortly before her death, aged ninety-two, she was described as having a face 'vivid and full of mystery'. She loved life, once saying: 'I had no talent but a talent for living.' 'Her acute powers of observation, her human insight, her eye for detail, her sometimes acerbic (but never malicious or hurtful) tongue made her a delightful conversationalist. After a meeting with her, one felt more alive, more aware of the possibilities of life and art,' wrote an obituarist. Roberts met Sarah in 1915 and spent the rest of his life with her. She was his wife, his friend, his muse, his business manager and his number-one supporter. The Red Turban is the first surviving portrait of Sarah. It was painted a year after the portraits of Stulik and Konody, and bears stylistic comparisons to those pictures. Although solidly drawn, the painting has a looseness to it, the paint being applied with sweeps of the brush. The face and body are sharply lit and the shadows painted in a mixture of local colours blended with neutral tones. Roberts's clear understanding of the human anatomy is evident, for neither the eyes nor the hands are rendered in the rather mannerist style tending to make itself evident in the portrait of her on the right, dating from six years later. Although Sarah makes no contact with the artist, her form is alert and vital. In this respect especially lie affinities with the portraits of Stulik and Konody. The colours are subtle and interesting: quiet but different, as was so often the case in Roberts's earlier work. In the picture Sarah is herself, a modern  maybe even a little bohemian  young woman. In the 1927 portrait, now in Manchester, Roberts portrays her in an altogether different manner. Her dark hair is swept from her face, she wears jewellery, and she is dressed as if for a party. She looks exotic and imposing: not like herself but like an imagined Sarah  larger than life, outgoing, and as delightfully foreign as Stulik had appeared. Her form is quite distinctly outlined, the eyes and mouth a little exaggerated and the hands too, while her arms and the blue top create shapes which are beginning to seem a little formulated, like one of Roberts's figure compositions. As has been seen in the Keynes portrait, too many flourishes of this nature, not backed up by an incisive enough analysis of character, detract from the rapport between sitter and spectator and leave behind questions about the artist's capabilities as an observer of human nature. I have to admit that many lacunae exist still in my understanding of William Roberts's life, and this talk is only a first attempt at trying to piece together the jigsaw. Much research still needs doing, and many more pictures need looking at in the flesh rather than being seen in sometimes inadequate photographs. However, as I see things now, Roberts's art seems to diminish in stature sometime before the Second World War, never to regain its early promise. His expectations seem to abate, and this, I think, can be seen increasingly in the way he came to portray himself and his wife from that period on. Sarah with Headscarf, c.1935, is altogether less grand than the portraits I have already discussed, while the double portraits of the Robertses painted in 1942 and 1975 further clarify this point. However, before looking at them, I would like to look at some of the self-portraits. William Roberts was, as I have already shown, a rising talent by the time he drew the portrait drawing on the left below. But his early diffidence, which could spill over into grumpiness, had remained with him. 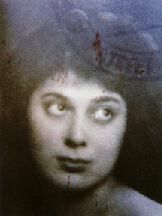 Helen Saunders, one of the Vorticist Group, talked in 1917 of his 'resentful old-gentleman-sulky urchin manner', though, she added, it was combined with a 'peculiar honesty and simplicity'. He seemed to engage people and then hold them at bay, or, in the worst cases, he simply turned his back on them. How lucky he had been so far with the outgoing Stulik and the kindly Konody; with all the praise and patronage that had flowed from the Slade; and, of course, with the vivacious Sarah! But the moment complex characters such as Lawrence, or people who inhabited a different milieu to his and were less open to his needs, crossed his path there was doubt and hesitation on Roberts's part. 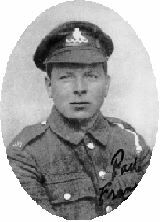 His memory was long, and many years later he wrote about such an encounter when he was on leave from the trenches. During lunch with a group of artists and writers at the Tour Eiffel he championed Duncan Grant's stance as a conscientious objector. Immediately one of the party slapped, him down, and, 'Intimidated by his rank and manner', as he put it, he fell silent. The Self-portrait drawing of c.1920 shows the aspiring artist, stylishly dressed in suit and tie confidently encountering his face in the mirror. Although the drawing of the jacket echoes Wyndham Lewis's portrait style of this date, this does not act as an irritant, for William Roberts is in charge of his pencil. The Self-portrait Wearing a Cap of roughly ten years later is rather different. He remains assured, if a touch sardonic, but he has changed from wearing a suit to dressing himself as a working man in cap and braces. And so he would continue to show himself in many other self-portraits over the years. Here on the left is a drawing of Roberts at work, one of a group of at least nine mainly full-lengths. When, in this series, he shows himself as the practising artist he becomes less self-conscious and his gestures and body language are relaxed for they are second nature to him. The drawing also shows his skill as designer, the crisp placing of the figure on the paper with its clear-cut outlines so much easier to accept than The Card Trick of 1968, with its clumpy, stolid forms and enigmatic message, which some commentators consider refers to the family trio of himself, Sarah and their son, John. When a smile does flicker on a face it is all the more touching for being so rare. In in a large, late double portrait [the 1975 painting above], Sarah has grown as rounded and friendly as a Russian nesting doll. And old age has even rubbed down the edges of her husband's sternness. But the eyes remain as fierce, blue, and suspicious as they were at the start. 'Bobby was not a pub man; he got his copy from looking through the windows,' explained Sarah. She was referring here to his figure compositions, but her words apply equally to all the portraits. T. E. Lawrence's 'oyster' never worked its way out of its shell; rather it became deeply encrusted within it. The portraits of Stulik and Konody, together with all the other work done by Roberts in the 1920s, are interesting pieces, but when the props of kindliness were removed he faltered. Diffidence, a propensity to take offence, artistic feuds  such as the one with Sir John Rothenstein at the Tate  when they muddle the eye do not make for the best portraiture. The finest portraits are those in which the painter gives himself over completely to what lies before his eyes and does not allow his own personality to interfere with the evidence. In my opinion, the prerequisite for a successful portrait is a fascination with, even a love, of people. In addition, the artist's active imagination and analytical mind are essentials, The greatest portraits have a universality about them, and in twentieth-century Britain I believe that the portraits painted by Graham Sutherland and Maggie Hambling fall into this category. Their vision is fresh, filled with wonder and inquiry linking them to a long line of artists  Titian, Rembrandt and Van Gogh among them  who repeatedly grappled with the complexities of the human psyche. Common to all of them is a perennial vitality and a permanent relevance. But let me not end on a negative note as far as William Roberts is concerned: his work will live on. 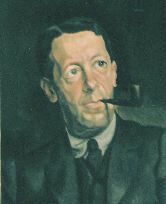 His portraits of the 1920s  including those of Sarah  and the portrait of John Maynard Keynes and Lydia Lopokova are distinguished, and, in the words of his obituarist in The Times, his reputation as a portraitist is 'deservedly high'.